Our 2018 Grand Final Winners on Swilcan Bridge! 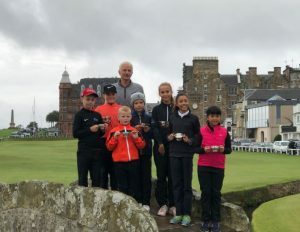 This year, we are please to announce that the 2019 Wee Wonders British Championships Grand Final is taking place in East Lothian on the 24th & 25th August, across three great venues of Gullane, Longniddry and North Berwick. Juniors in the Boys 11-12, Girls 11-12 and Boys 9-10 age category will play two rounds of 18 holes (1 on Saturday, 1 on Sunday) at Gullane’s no. 3 course. Juniors in the Girls 9-10 and Boys 7-8 age category will play two rounds of 9 holes (1 on Saturday, 1 on Sunday) at Longniddry Golf Club. Juniors in the Girls 5-8 and Boys 5-6 age category will play two rounds of 9 holes (1 on Saturday, 1 on Sunday) at North Berwick’s 9 hole children’s course. More information will be published in due course. The cost of this year’s Grand Final is also still to be confirmed and invitations will be sent out after each Regional Final is concluded and the results are verified. The top 2 in each Regional Final will receive an invitation to the Grand Final, with all 3rd place finishers being placed on a reserve list. Those that qualify for a reserve place will be contacted after all the Regional Finals have been concluded and the places have been calculated. The reserve list will be ordered based on proximity to the winner of their Regional Final and then by field size (largest field first).